The official kick off to summer is almost here, Memorial Day weekend! To go along with this fun filled weekend is the FIRST ever NATIONAL PINOT GRIGIO DAY on May 26th. 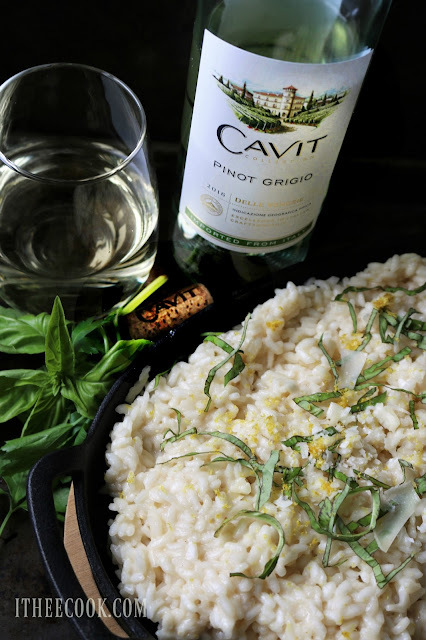 I just love Cavit Pinot Grigio it happens to be one of my favorites. It's light fruity and perfect for any summer gathering. 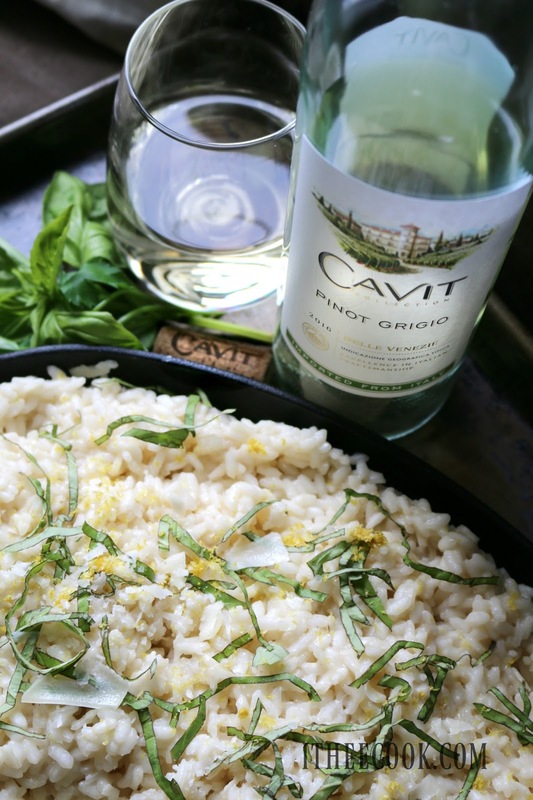 Cavit Pinot Grigio was launched in the United States in 1977, and is the #1 Italian wine in America. To pair with this delicious is Cavit Pinot Grigio is this risotto. 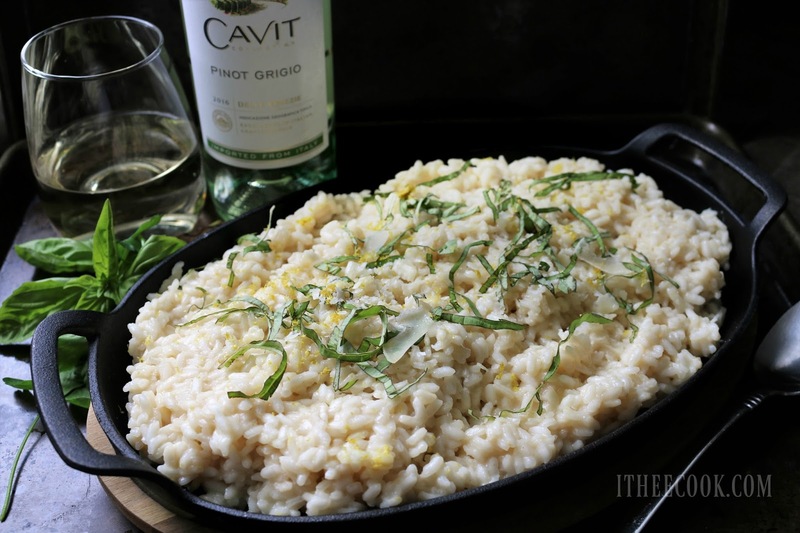 Nice and light with the hint of lemon and basil, this is the perfect match. You can add your favorite protein or just serve it alone. It also makes a perfect side dish for the holiday weekend. Have a very happy National Pinot Grigio Day and a wondefrul MemorialDay Weekend! Bring stock to a simmer in a large saucepan. Keep warm over low heat, but do not boil. Heat a Dutch oven over medium heat. Add oil to the pan and swirl to coat add the garlic take care not to burn it. Add the Arborio rice and salt, cook 1 minute, stirring frequently. Add 1/2 cup stock; cook 1 minute or until liquid is absorbed, stirring frequently. Repeat this process with the remaining stock stirring constantly until there is 1/4 cup of stock left. About 20-25 minutes. Remove pan from heat. Stir in the 1/4 reserved remaining stock, salt, lemon juice, and parmesan cheese. Top with basil leaves, lemon zest and more cheese if desired. *This post is sponsored by Cavit. As always all opinions are 100% my own. 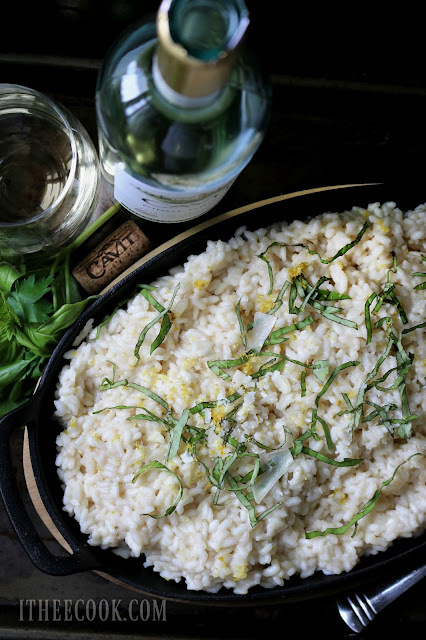 Your Risotto looks amazing! Thanks so much for sharing your awesome post with us at Full Plate Thursday! Hope you are having a great week and come back to see us real soon.